Money plant is believed to increase the financial condition of people and that’s why you can either bring this wonderful gift home or send it to someone dear and wish on any happy occasion. 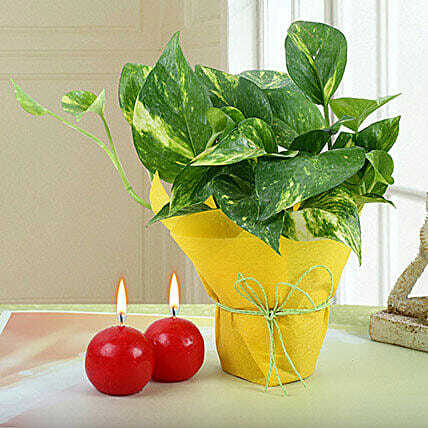 This profitable plant is combined with two attractive red candles and that is adhering much brightness to this gift set. Keep plants in medium light locations, out of direct sunlight. Natural light is best, but some plants can also thrive in office fluorescent light. Plant soil should be kept moist at all time. Be careful to avoid overwatering. Do not allow plants to stand in water. Avoid wetting plant leaves excessively. A spray of water should help in case of flowering plants. Plant should be kept in a cool spot (between 18-28°C) for best performance. Remove waste leaves and stems from time to time.